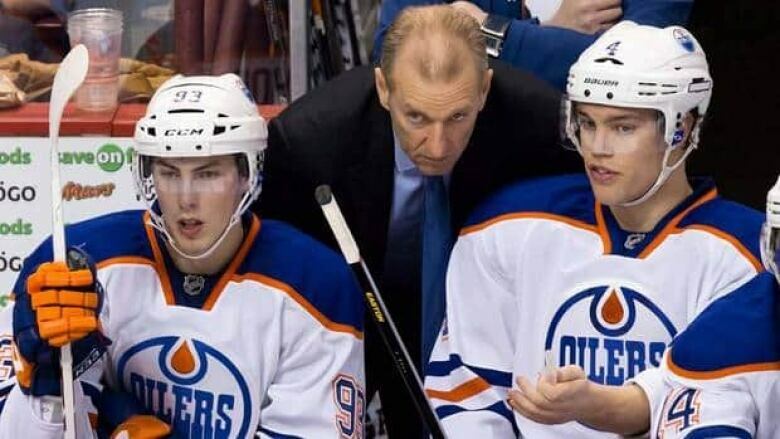 Edmonton Oilers have fired head coach Ralph Krueger. Craig McTavish, the new general manager, made the announcement at a late afternoon presser. Ralph Krueger paid the price Saturday for the Edmonton Oilers' latest disappointing season. Krueger is out as head coach after guiding the Oilers to a 19-22-7 record this past season. Edmonton finished 12th in the Western Conference and missed the playoffs for the seventh straight year. General manager Craig MacTavish said he spent a week in discussions with Krueger about bringing on a veteran assistant coach. "During the process of me conducting those interviews, I recognized I was trying to add a coach that was more closely aligned with the way I wanted to run the team and less about supporting Ralph and the head coach of our team at the time." Krueger spent one season as head coach after serving as an associate coach for two seasons. MacTavish, who took over as general manager this spring, said the team is "very close" to hiring a new coach. But he said the deal hasn't been formalized, yet, and wouldn't say who it was. The Oilers, who are loaded with top young players like Taylor Hall, Jordan Eberle, Ryan Nugent-Hopkins and Nail Yakupov, will have their third coach in three seasons. Some of the potential options include Lindy Ruff, Alain Vigneault, John Tortorella along with Dallas Eakins of the AHL's Toronto Marlies. However, Hockey Night in Canada's Elliotte Friedman believes Eakins is Edmonton's top choice, and an announcement could be made to hire the Marlies coach as earlier as Monday. Krueger, 53, was the head coach of the Swiss national team from 1997-2010. He led the team to 12 world championship appearances and three Winter Olympics. He also previously coached VEU Feldkirch in Austria's first division. MacTavish admitted the decision to remove Krueger would be disruptive to the Oilers, but he said his other concerns trumped any issues about continuity. "Philosophically, I differ somewhat with Ralph and it doesn't mean my strategy is right or Ralph's strategy is right. But I'm the general manager and it's my job and my decision to make and that's why I've made that decision," MacTavish said. MacTavish noted that he was still interested in bringing on a new assistant coach. He also said there were more "difficult decisions" to come and that it would be a "tumultuous" summer for the club. He lauded Krueger's commitment to the players and the Oilers organization. "Ralph was unquestionably 100 per cent committed to the Edmonton Oilers. His passion and energy is amazing and we wish him nothing but the best as he moves forward in his impressive career."